also be given by clicking in the appropriate menu box on top of the screen. menu box is shown. COMMANDS ARE CASE SENSITIVE. multi trace mode are desired, press u, back again with u or y.
station with y and back again with y.
channel and pressing & and then r for repolot. zoom, meaning picking the last point first. read phase AMP but only after using a twice for reading amplitude. d:        Delete phase. Position cursor near phase and press d.
from EEV, only file names in S-file are deleted. E:        Call external program (defined in MULPLT.DEF) to compute spectrogram. g: Groun: Make a ground motion seismogram(s). the model defined in STATION0.HYP is used. and the iasp.out file is deleted. n:        Filter 10- 15 hz, see below. one of the multiple windows. data on screen. Only multi mode. Response info not saved. wanted with new parameters e.g. filter. will appear below with noise spectrum. 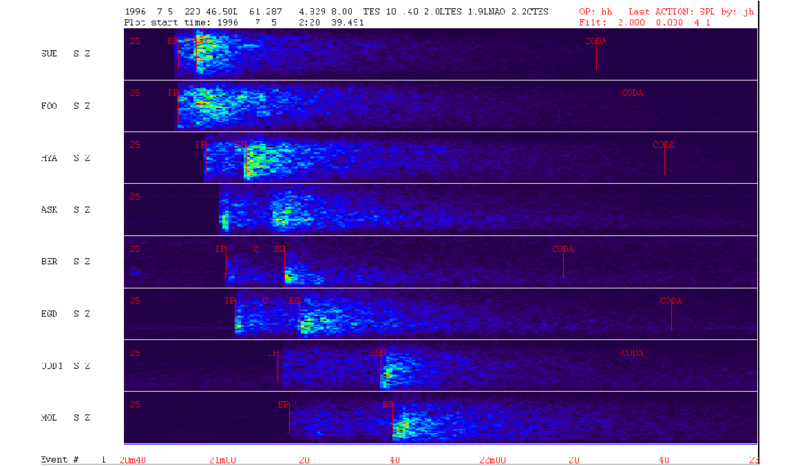 s:        Make a spectrogram of all traces, multi trace mode only. S:        Same as s without the noise spectrum, singel trace. S:        Select station for area selection, only multi trace mode. user is asked for the backazimuth angle. v:        Filter 1-5 Hz, see below. for one station, for more stations use 'u'. on next plot (using R or zoom). the last selected filter, only in multitrace mode. *: Scale: Fixed scaling of trace amplitudes. _: Dist:  Select plotting channels in distance order. :  Resp:  Plot response file, single trace mode only. v: 1 - 5:  1.0 -  5.0 Hz  go the other way and it is now an 8 pole filter. b: 5-10 :  5.0 - 10.0 Hz  From menu, only 4 pole filters are used. remains fixed until pressing ',' again. &        Overlay, see in beginning of help section. Combining options: Note that you can select several options together. saved when you pick the next trace in Multi mode. 5 10        4 pole band pass, command . 0 10        4 pole low pass, command . 10 0        4 pole high pass, command . -5 10       4 pole band reject, command . WHEN PLOTTING, THE FILTER LIMITS, NUMBER OF POLES AND NUMBER OF PASSES IS WRITTEN ON THE SCREEN. For band pass filters, the number of poles for both frequencies is the same. When doing spectral analysis or response removal and specifying a filter before, the filtering is done in time domain and the filter has the number of poles specified by the user, default 4. NOTE:When reading polarities, DO NOT USE FILTER, if possible. Filtering and instrument correction: Since filtering is done in time domain, there is an added stability filter in frequency domain to avoid low frequency blow up. This filter is a 4 pole HP filter at 1/5 the filter low frequency corner. Filter limitations: For frequencies below 0.5 Hz, only 4 pole BP and BR filters can be used. If the user try to select another number of poles, the number of poles is set to 4. Filtered output: Extracting data with WAVETOOL, option 'Out'. It is only possible to use 4 pole BP filters, forward in time, using any other filter and the data is not filtered. Using option OutW any filter can be used but then only Ascii Helmberger format is possible. WAVETOOL can then convert to any other desired format. Prior to version 9.1 MULPLT used a 4 pole Butterworth filter in time domain and an 8 pole Butterworth filter in frequency domain. The filters in frequency domain were use in connection with instrument response correction and spectral analysis. It has turned out that the frequency domain filters distorted the signal in some cases, particularly for narrow band and low frequencies. Therefore, frequency domain filters are no longer generally used. The change in filter setup, might change Ml magnitudes by 0.05 to 0.1 depending on which filter (if any) was used. In each trace header in the SEISAN waveform file, there is a flag to indicate if the time might be uncertain (see Appendix B). If that flag has been set, the message `UNCERTAIN TIME' will be displayed on top of the trace. Currently this flag is only put into the waveform files if the data comes from a SEISLOG system that has detected a timing error or if the data is converted from SEED/MiniSEED data. Simlarly plotting SEED/MiniSeed data, uncertain time will be displayed if that flag is set in any block in the time window read in for a particular trace. Figure 8.2: An example of using MULPLT in multitrace plot mode. Notice that start and stop times are different for different channels. The horizontal line at the start of the plot is the DC level. The small number above each trace to the right is the max absolute count with the DC-level subtracted and the small number to the left above the trace is the DC level. If plotting from EEV, the phase picks available are shown. Figure 8.3: Examples of MULPLT with theoretical arrival times of some global phases. 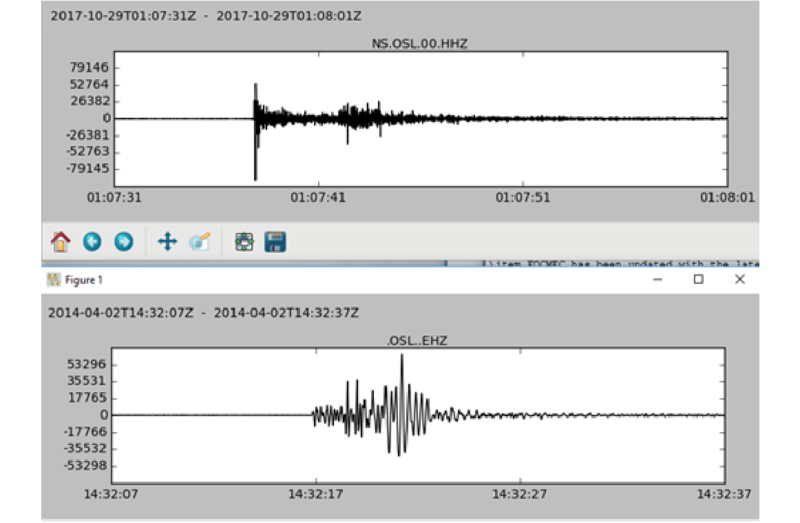 Short period seismograms are shown. The theoretical phases are marked with onset y below the trace and the read phases are marked normally above the trace. 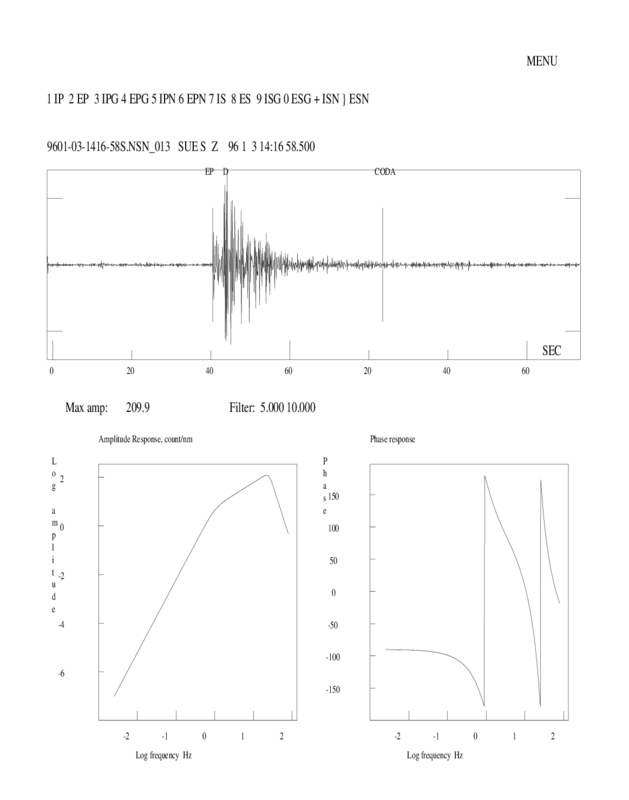 Figure 8.4: Example of MULPLT with theoretical arrival times showing global phases on a long period seismogram. The filter used from 0.01 to 0.1 Hz. Without filtering, almost nothing would have been seen on this broadband station. Figure 8.5: MULPLT in continous mode. The plot shows 6 hours of long period data. The scale is 3000 counts between the traces and the filter used is from 0.01 to 0.1 Hz. The trace start time in hours and minutes is given on top of each trace. On the header line, P1 means the first page and DC is the DC level subtracted. Note that the numbers on the time scale at the bottom only are valid for the first trace unless all traces are 60 sec or 60 min long. Figure 8.6: Example of the menu, which can be displayed on top of the plot. To apply filters, first make a selection of options (filter, window, channel selection) and then execute by pressing R(Plot) (or selecting a zoom window). Figure 8.2 shows an example. In this mode, one trace is initially displayed on top of the screen, see example on Figure 8.7. The traces used are the ones earlier selected and will be displayed one by one. Several options are now possible as can be seen on the menu. Normally no hardcopies are made in single trace mode since it is intended for fast routine work. However, by starting MULPLT in multitrace mode (option 2) and then go to single trace mode (command T(Toggl)), hard copy files are made. In this mode hard copies can be made. If option 2 is used, both screen plot and hard copy files are made. If replot is made, only the last plot is available in the hard copy file. If option 3 is used, which is only hardcopy, there will be additional questions about, window length, start time, scaling and filters. If the scaling is set so that the plot occupies more than one page, several pages will be printed. If in this mode, filenr.lis is given as file name, the program assumes that all the files should be plotted and the only questions will be about the scaling and filters. All channels in each file will be plotted. This option is useful for plotting a large number of events with a single command. In this mode, all channels for selected stations are displayed in a new window. This mode is particularly useful for working with three component data. By selecting one or several stations in multrace mode, all components for those stations will be displayed in new window by pressing y or ALLC on menu. Similarly in single trace mode, prsssing y or ALLC will display all channels for that station. The user can then go back to e.g. multitrace window and select another station to work with in three component mode. If many channels are available (like more than 30), it might be difficult to distinguish all and the channels can be displayed in multiple screens. The number of channels per screen is set in MULPLT.DEF. The number of windows or screens for a particular data set is given in top left hand corner as e.g. `Win 2 of 7' meaning current window is number 2 of 7 windows. To move to the next window, use TAB or NextW in menu. In each window, normal operation can be done. Channels selected will be kept. Using a large data set, the user can then view each window separately, select the channels of interest and when all channels have been viewed, only the selected channels will remain for display. It is possible to togle between showing all channels and multiple screens by pressing N.
Plotting stations in a given distance range When many stations are available, it might be useful to only plot only the stations nearest the epicenter or a particular location. For this option to work, parameter MULPLT AREA in MULPLT.DEF must be set to a value larger than 0.0. for more information, see section Working with many channels in MULPLT"
Channels are plotted by epicentral distance or in alphabetical order according to station name, see parameter NSORT_DISTANCE and CHANNEL SORTING in MULPLT.DEF. They can also be plotted in the order they are stored in the waveform file(s). By setting the channel order parameter in the MULPLT.DEF file, it is possible to plot the channels in distance or time order. If MULPLT is started from EEV (and NSORT_DISTANCE is set), the channels will be plotted in epicentral distance order unless the station if is not in the station file . If the event does not have an epicenter the location of the station with the first pick will be used as the epicenter for the ordering. Since there is no consideration for channels for the same station, the channels for one station, will be plotted in the same order as given in the waveform file. Ordering can be turned on with the key "-" or pressing (Dist). If set in the MULPLT.DEF file, it is set when MULPLT starts up. It cannot be turned off for a given event when set from MULPLT but the flag is returned to the default value for the next event. If a continuous data base is set up (see section 2.2.3), it is then possible to plot all traces from the continuous data base with MULPLT. When MULPLT starts up, use option cont and the user is prompted for a start time and interval. MULPLT will now check all continuous data bases for available data in required interval and display the available data. The forward (next) or back option will display previous or next window respectively. There is an 25 % overlap between windows. If no data is available for the whole window, no trace is shown. If the beginning and the end is available, a line will join the two segments. If only end or beginning is available, only the available data is shown. All normal operation can be done on the window plotted so it is possible to e.g. extract data. If the register option is used, the whole window is extracted from the continuous data base as one file, copied to WAV and the S-file created.